This is the life of the aileurobibliophile. Over the years I can not completely tally the amount of times I walked out of the room to return to find this scene. Go out to get a drink and come back to find my previous spot occupied. 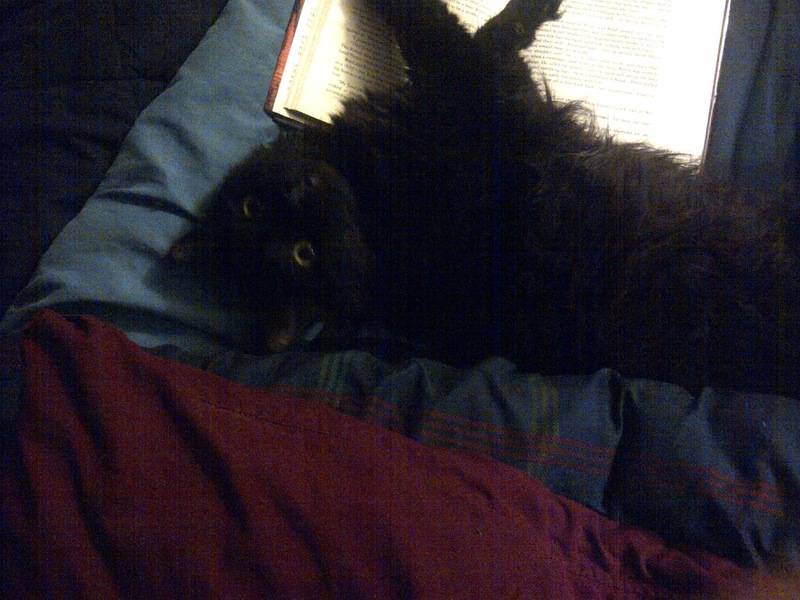 Other times I have been minding my own business, relaxing with a good book only to have my cat interpose himself between myself and the book. Being a cat owner for most of my life I understand that the nature of the cat puts himself in the center of the universe. I understand this completely. 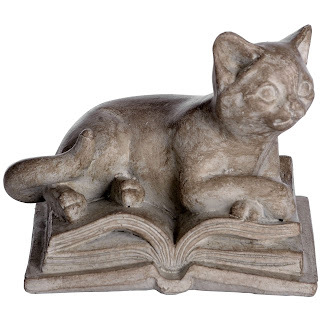 But is the threat of the book to the cat so offending that he must physically put himself me and the offending object which commands my attention? 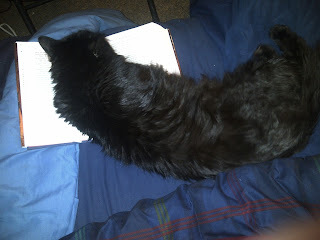 On many occasions I have put the book aside to shower him with affection. He knows that our bond is true. Yet still he is jealous... or is he? Oh. I get half. I thank your benevolence. Could he be seeing the fascinating connection that I am having with this mystical object? 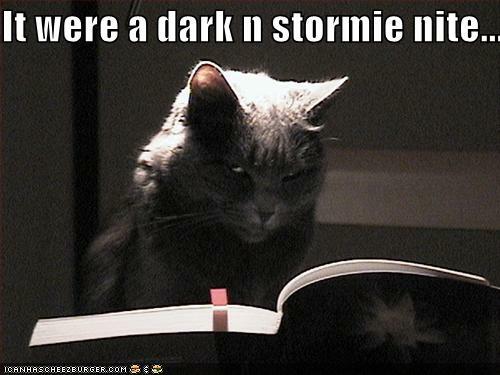 Is he understanding that this magical tome is something 'interesting' and 'fun'? Is he simply trying to join in with the fun that his human is hogging all to himself? Is he sitting there pondering, wondering why the large overlord is not sharing this wonderful toy with him? This toy which does not smell of tuna or catnip. Neither dazzles like the red dot nor tinkles like the elusive rubber ball. 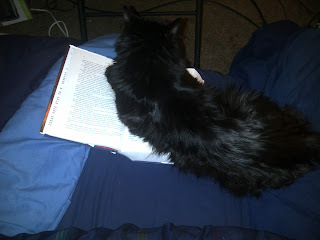 Is he too trying to join in on the reading enjoyment? You're doing it wrong! You need to look at the words! This ancient stone talisman unearthed from an ancient Babylonian dig shows that this occurrence is not new. 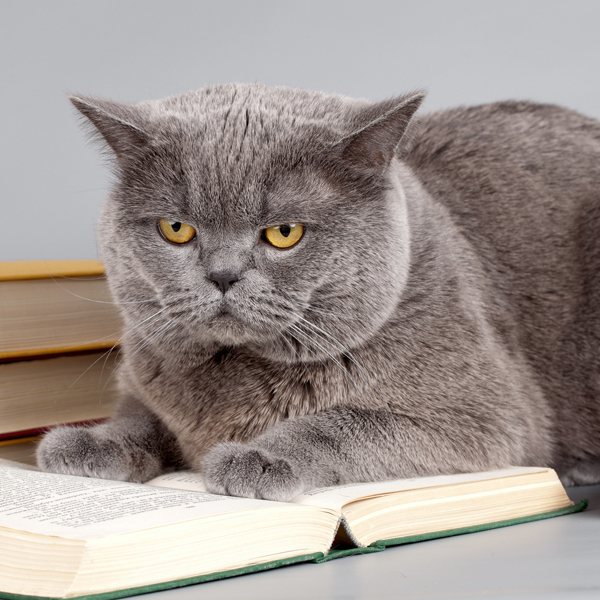 We book-loving cat fanciers have been dealing with this constant battle for attention between feline and the the written word. Perhaps the sensitive nose of the cat too knows the joy of sniffing a good book. The aroma of which tantalizes the senses and comforts the soul. Perhaps the cat is wondering why for someone who can't smell nor see in the dark like a decent person holds his nose away so far? Worries of the ancients too. Perhaps the truth is that he has already read the book while you were away. Ignoring him, quite obviously. Leaving him to scratch his own ears and to entertain himself. What the cat THINKS he's doing.